Mastered by George Marino at Sterling Sound. Download files authored direct to native DSD from analog tape by Gus Skinas. 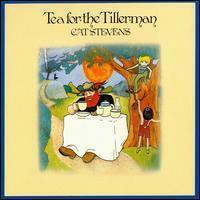 Tea For The Tillerman is one of Cat Stevens' finest albums and a gem in the crown of early 1970s singer/songwriterdom. Stevens manages to have his cake and eat it too, simultaneously achieving pop accessibility and artistic relevance. The feel is decidedly gentle and spare. Apart from the occasional string section, Stevens is accompanied only by a three-piece band as he sings his introspective lyrics with appreciable favor. Probably my favorite DSD albums from my collection; and I was not even a Cat Stevens fan. While recently re-organizing my music files to make room for my foray into high-resolution music, I thought my re- mastered CDs of Cat Stevens would be safe from the temptation to upgrade. So when I saw "Tea of the Tillerman" on the DSD list, I played my ALAC version of "Where Do the Children Play?" for reassurance. Still an impressive experience, but I thought that yes, with an original recording of that high quality, I bet there is still some room for improvement. The upshot: This DSD will leave you powerless to get up from your chair while it plays and exhilarated when it is over. As the previous reviewer alluded to, the DSD format of this album makes you feel like you are there in the studio with Cat Stevens. In fact, it sounds so good that I would actually consider parting with the vinyl version we have... if space becomes an issue. And that says a lot coming from a vinyl addict! The sound is amazing. I have over 200 SACD's of varying quality. I also have several Blue-ray audio discs. This is my first DSD download. I have it on a flash drive and plug it into my Oppo CD/SACD/Blu-ray player. The sound is as good as any SACD I have. It is really thrilling to feel this close to the music. Highly recommended.